Home Quilting Tutorials Machine Sewn Nifty Quilt Binding. Unique & Fast Quilt Binding. Machine Sewn Nifty Quilt Binding. Unique & Fast Quilt Binding. SCROLL DOWN & FIND THE WORDS “Next Page” Highlighted In Larger Color Text. If you’re quilt binding averse, this might pull you back in, because it’s different, Fun, FAST & EASY. This is soooo… Creative, you can tell it was born out of desperation to change the rules on how to add a binding to a quilt. We like changing the rules. Isn’t that kind of like freedom at its best! Using Yarn to create an artificial ditch is pure genius and in this case great FUN! Also using simple tools like a presser foot with a hole in it and one of our favorite presser feet, the edge joining foot, adds to the uniqueness of this fast quilt binding technique. This is different and because you’ve never seen anything like this before, you’ll automatically reject it at first. That’s an automatic survival instinct, shutting down your thinking brain, before you can even have a chance to think about it. It’s how we’re all made. Like it or not anything new is usually discarded by our brain before we get a chance to even think if it makes sense. 3. Traditional Connecting Binding Ends at the edge of your quilt. Next Page below watch how Sara uses Yarn to speed up quilt binding. How do you handle the corners? My question exactly, but you beat me to it, lol! Exactly my question, no info on doing the corner, need that info!! Like your technique, I also would need info on the corners! Definitely need info on the corners! Worth a try! Love this idea – but need instructions on sewing the corners, please! Great technique! Would like to have seen the thread a darker color for the tutorial. And what would you suggest if we don’t have a preset foot with a blade in the middle? Thanks for sharing! I have a grand daughter learning how to sew all of this information will be wonderful for her to learn thank you for them! Where can I purchace the ruler used in the tutorial for straight line quilting ? I think you would want to change your bobbin thread from the wash-away before sewing the binding onto the quilt. I am physically challenged when I hand stitch so your method is very welcome. I can’t wait to give it a go! Thank you for breaking down the information about how the sewing feet and threads are used. Well presented. Below the video you just watched click next page it is a video for corners. Hey butch I just said it was a corners video. Didn’t say it was the same method. I have never before heard of wash away thread…how brilliant! Wow! This seems like the most complicated way to bind. Very interesting. I like Kathy Donnelly Sawyer’s method better, but perhaps one day I will want to try this. Can you please explain Kathy Donnelly Sawyer’s method of quilt binding? I’m just a beginner, so I need all the help I can get! Rosemary Sanker Neiss I will. Kathy Donnelly Sawyer has been a Pfaff teacher and is in my quilt guild. Pfaff has an “offset” foot that we use. Cut the binding 2-1/4″, press in half; attach to BACKSIDE of quilt with 1/4″ seam allowance, using your 1/4″ foot. Wrap to front side. Put OFFSET foot on. Make sure you have your zigzag throat plate in place. Move your foot about 5 movements to the left so the needle catches close to the binding edge. The offset foot rides right along the left side of your binding, yielding a perfectly straight stitch. If you want to know more about the method, let me know, or better yet Kathy Sawyer, to talk you thru her wonderful way of turning corners and finishing the binding. Cathi Audas Jamison Thank you so much Cathi! I will give this a try later this afternoon. Your directions are perfect! Sugar & Cream thread is all cotton. Will it shrink & and pucker the edges of the quilt when laundered? Leilani, check the out… Pretty neat! Thanks for all the great tutorials! I am not thick but I can never get these tutorials to play. Ashley Wansley, I’m gonna try this on my next one! Looks very fussy, by the time I did all that I could gave hand sewn the binding! Except for 1 or 2 times, I have always sewn quilt binding on with a sewing machine and never had any problem doing it. And my corners are always perfectly mitered, too. No need for yarn. I have been doing this on all my quilts! I wonder how all of that washes. I knit with that yarn a lot and it shrinks quite a bit when it is washed, maybe all the stitching would prevent that. I also wonder it you are just adding bulk in your corners. A lot of work to just stitch down a binding… I’ll do it my way..
Rebecca Frasier, did you see this? This is really neat! Thanks for sharing! I like the idea, but I need to see how to do the corners and ending. I went to the blog but the videos would not open. HELP please!.!.!. Just a lot of extra work and for newbee’s, well it will be a bit too much for them. Well, that is different. If I ever try this method, it will be on a very small quilt. Kathy Donnelly Sawyer, do you have any tutorials? Have you considered doing some? Your directions are excellent. ALSO, have you considered teaching classes on Craftsy? That is different. I may have to try it. These are great tutorials on binding that make sense to me. Joy Daphene Holmes Gray do you do very much quilting ? When I used to sew for public all those years ! I made lots of baby quilts when I decorated nurseries. Also did some daybed size. I did it all on the machine . that’s what I was thinking. If I crochet a wash cloth is does shrink after washing. Jenny Edlin. Seems very involved to me. Love Husquvarna Viking sewing machines!!!!! Think I will stick to hand sewing the binding. I hate binding. That is my project today. I have about a foot left to hand sew on the quilt I made as a house warming for a friend in Alaska. I am so excited, I get to hand deliver it! What do you think of this Sandy Breslin? I think Connie used to teach this or somthing like it. I’ll stick to finishing by hand. Carol Gerow…….Have you used this technique? Haven’t tried this but it looks like it’s one I would like to try ! Does not show how she miters the corners. Seems like a lot of work. Ok, I’m going to try this ! I hate sewing binding. Where may I purchase these? Most quilt shops, if not they will order them from one of my distribution centers. I’m in Galveston County and haven’t found it. May I order direct locally? Always willing to try something new! Kim Carman have you watched this ? 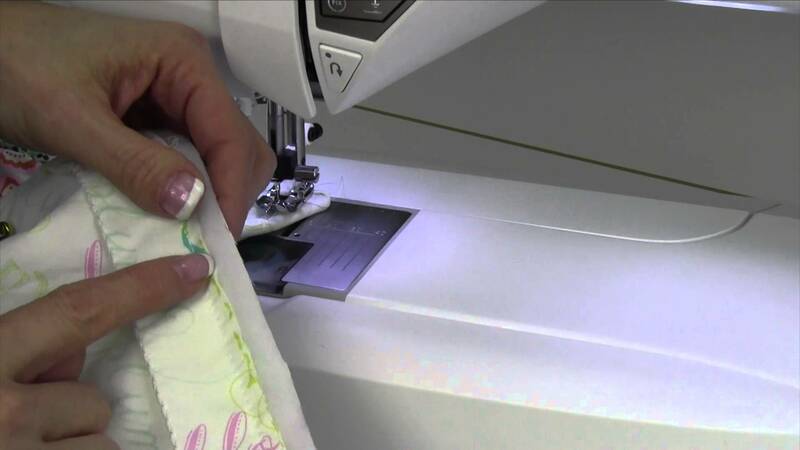 Pretty neat way to machine sew on binding. Shelly Ward Amanda Lindsay Bastian Elaine Warr Carolyn Bird Tonya Cook Marzo Check this out!!!!! WOW how easy is this? Look up Susie’s Magic Binding on Pinterest! Super easy & all done on the machine! I like this. Underside looks good! Bindings are the only thing I do by hand. Have you washed any of them, and did the yarn shrink? I’m going to try this. I don’t like the way my machine finished bindings look so I do them by hand. I think the yarn will leave an added dimension to the binding that really appeals to me. Thanks! Sorry but I think that’s too much fiddling around. Tried to take me to an alternative site to clear about the viruses on my phone. Be careful. I have to try this one. What about the cotton yarn shrinking when washed? I purchase everything to do this binding. It isn’t as easy as she makes it look. I don’t like how it turned out. Won’t be doing this binding again!